I have a tendency to be a little erratic when it comes to my grocery shopping. 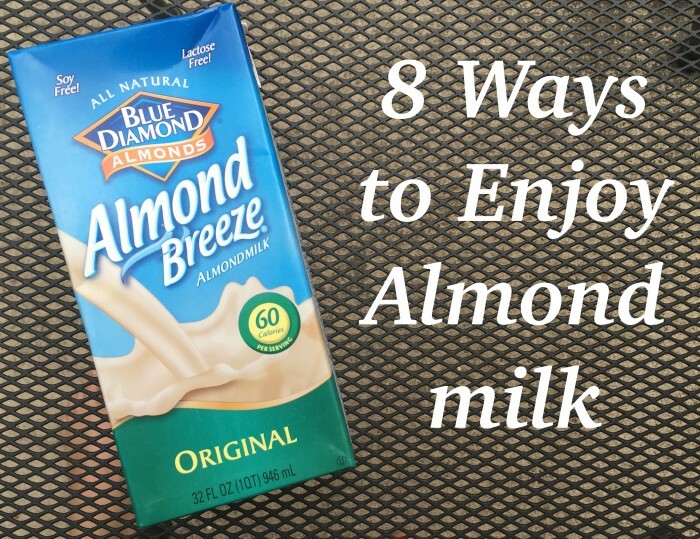 There are very few items that are guaranteed to be on our shopping list every week but Blue Diamond Almondmilk is one that always makes the list without fail. 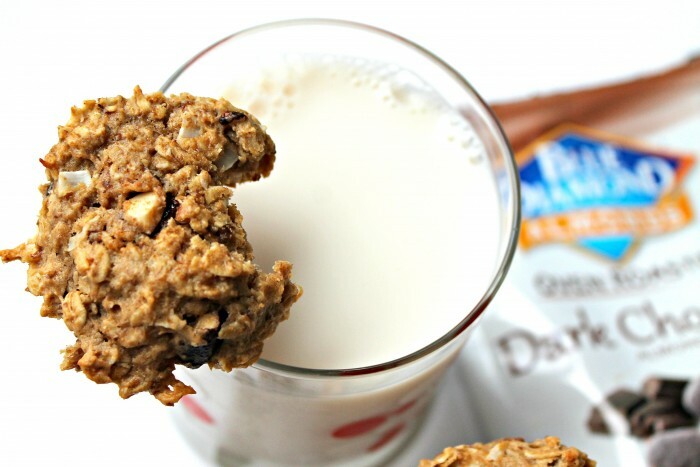 We use almondmilk for so many recipes or simple in our cereal or as a beverage to drink. Here are 10 ways that we like to enjoy our almondmilk. 1. A big cold glass. I’ve never really been a huge milk drinker of any kind but sometimes a nice cold glass of almondmilk is in order. Cool, creamy and a perfect snack. 2. In your favorite cereal. We don’t do dairy around here so almondmilk is our liquid of choice to wet our cereal. Edith and I love to drown our cereal in almondmilk while Neil likes to use the least almondmilk possible to wet his. 3. In mac and cheeze. If you have been a reader for a while you know that mac and cheeze is a weekly occurrence at our house. My favorite version involves almondmilk, nutritional yeast, shredded vegan cheddar cheeze and spices. 4. A dipper for cookies. I grew up with cookies and milk and still as an adult I love to enjoy a glass of almondmilk with my cookies especially chocolate chip cookies. 5. Smoothies! This one is probably pretty obvious but there is nothing better than a creamy smoothie made with almondmilk. I love almondmilk, banana and chocolate protein powder because it tastes just like a milk shake. 6. In sauces. I use almondmilk as a milk alternative in dairy heavy sauces such as the mac and cheeze I mentioned above or a béchamel sauce to name a few. Side note the unsweetened almondmilk works really well to make a béchamel; once made use it for a yummy vegan lasagna or add pesto for a creamy pesto pasta. 7.Acai Bowls.Who else is on the acai bowl train? I can’t get enough of them. My favorite base is acai, banana, strawberries, vanilla protein powder, almond butter, almondmilk and ice; simply blend and top. Disclaimer: This post is sponsored by Almond Breeze Almondmilk. We have been having some crazy hot days around here and when it’s 80F I really have no desire to cook or really spend any amount of time in my hot kitchen. So, whenever that happens I bring out the blender and start whipping up smoothies and shakes. 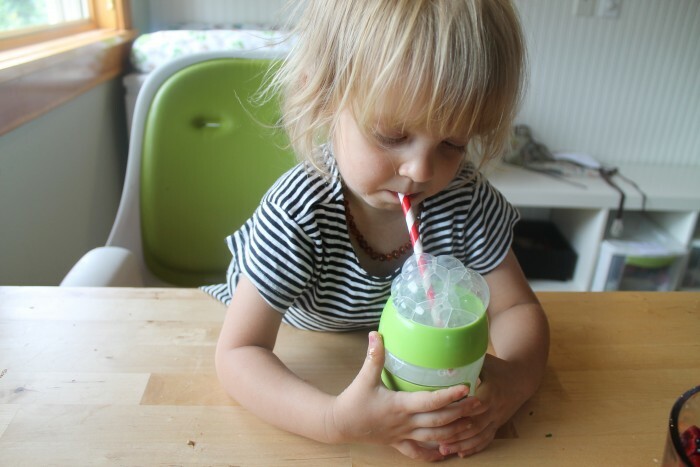 This week Neil and I were all about the chocolate “[almond]milk shakes”. Our milkshake bases always start with a heap of frozen bananas and a non-dairy milk from there we like to mix it up depending on what we have on hand or are in the mood for. 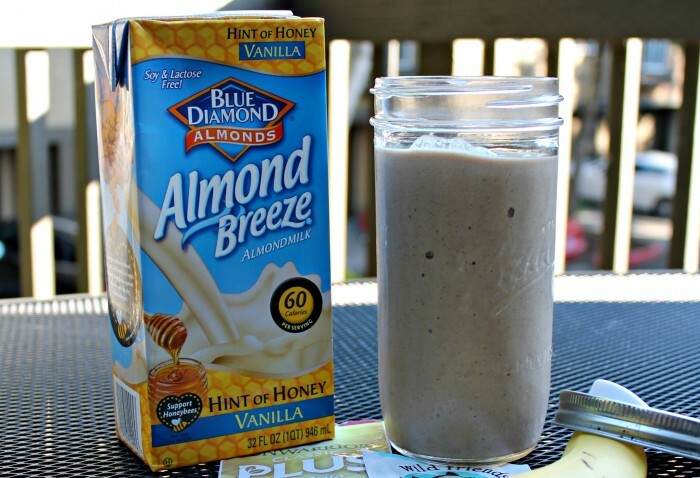 This week we had a carton of Almond Breeze Almondmilk in the Hint of Honey-Vanilla flavor so that is what we used as our liquid for our shakes. We also added in some chocolate protein powder and in this particular one a chocolate peanut butter but most of the time we use almond butter. *Tip 1: Freeze your bananas when they are super spotty because that is when they are the sweetest and easiest to digest. 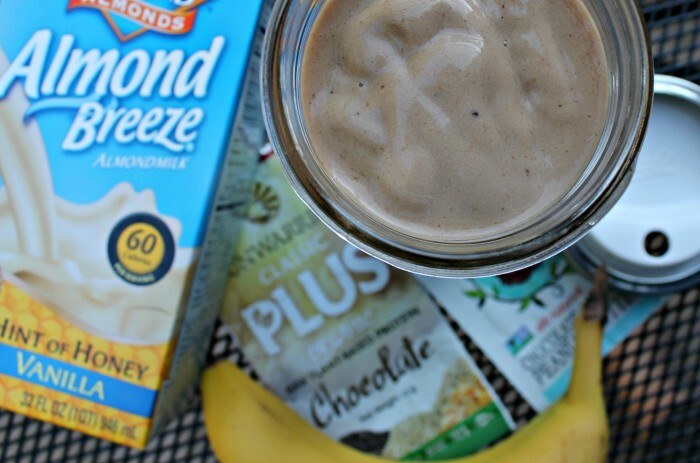 **Tip 2: For a shake start with 16oz of almondmilk and add more as needed. 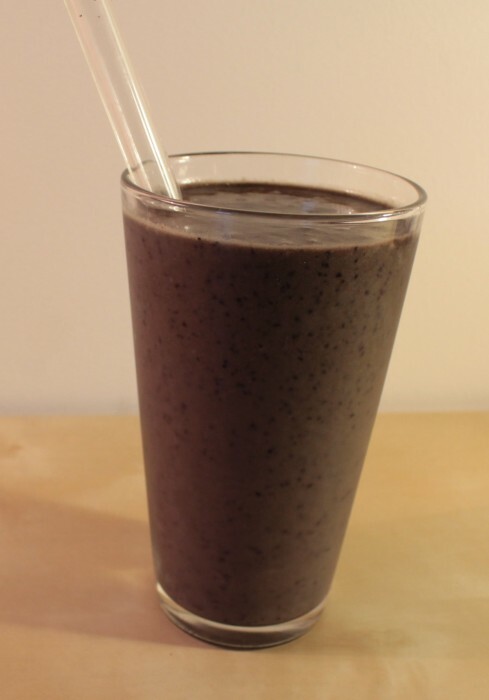 If you are more into a smoothie/thinner consistency than start with more almond milk. 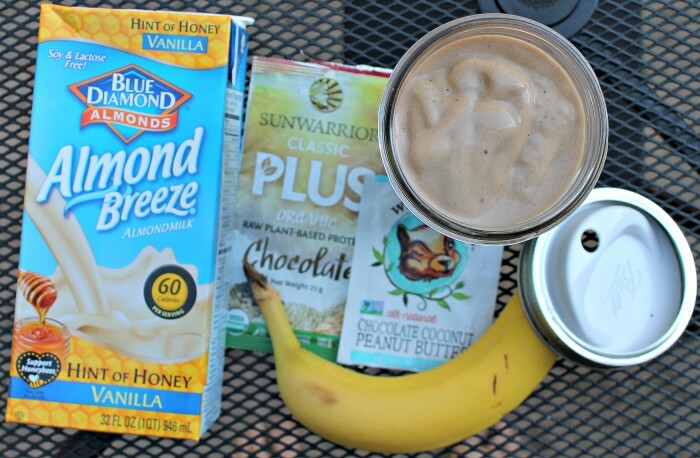 I found the Almond Breeze Almondmilk in the Hint of Honey-Vanilla to give this smoothie a subtle extra sweet taste. 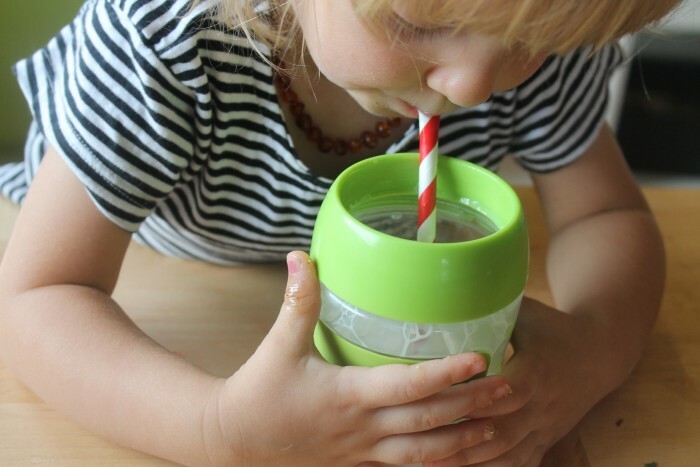 I tasted it on it’s own as well and it’s sweet but a much more mellow sweet – perfect for smoothies and shakes. What’s your favorite warm weather breakfast? 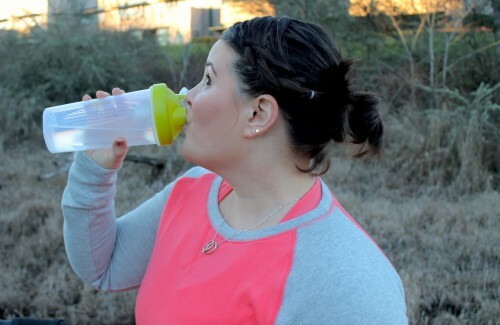 Are you a thick smoothie/shake fan or a thin? When we were on vacation in Rhode Island we visited Wildflour Bakery and they had a smoothie on their menu that included granola. Neil and I were both intrigued and if we had made one more visit we probably would have tried it but instead we shared a green smoothie. When I arrived home I remembered I had a few sample packets of Blissful Eats granola so I decided to make my own version of Wildflour’s breakfast smoothie. 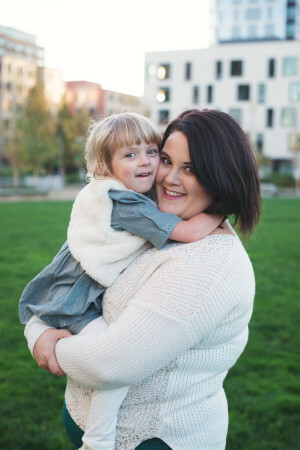 I know I have been pretty absent from my blog lately but I am working on getting back in the swing of things and the posts should start to flow again. Hubby and I spent the day trying to be productive and yet relaxing and fun as well. We started out with a trip to Plato’s Closet so that we could see how much dinero they would give us for our old clothes. We made out pretty well so we treated ourselves to a huge veggie sandwich at Martone’s that was filled with veggies, hummus and tabouli it was massive so we got one to share, I wish I had taken a photo of it. After a wonderful lunch we decided to go to a matinee and we saw Date Night which was absolutely hilarious! Preheat oven to 425F. Mix the BBQ sauce, soy sauce, water and sirracha together and pour into a small baking dish. Place the tofu in the sauce and flip over a few times to coat. Bake for 40 minutes, flipping half way. Preheat oven to 425F. Toss the broccoli with the olive oil, salt and pepper. Place the broccoli in aluminum foil and create a closed packet. Place in the oven and bake 15-20 minutes. In a small pot heat the olive oil over medium heat and saute the onion and garlic for 3-5 minutes. Add the water, bouillon and saffron to the onion and garlic and bring to a boil. Stir in the quinoa and return to a boil. Cover and turn the heat down to medium, and cook 12-15 minutes until the water has been absorbed. Take off the heat and fluff with a fork. Add the nutritional yeast and salt and pepper to taste. Let sit covered for 15 minutes before serving. Place everything in a food processor (a blender really won’t work not even a Blendtec or Vita-Mix) and processes until fluffy smooth and softserve like.